UPDATE 29/02/08 (II): New NOTAM warns aircraft for decaying USA 193 debris between now and March 9th. See my post here. 21/02/08: THEY DID IT! more below. UPDATE 20/02/08: Sources say rough seas in the Pacific might prevent taking a shot at USA 193 on Wednesday/Thursday night. UPDATE 19/02/08: John Locker has drawn attention to a second NOTAM for the same area, one day later. This is probably for a possible second attempt if the first one fails. UPDATE 18/02/08: Ted Molczan has drawn attention to a NOTAM issued by the US Government that might point to a possible ASAT attempt on USA 193 on Feb 21, 3:30 UTC as USA 193 passes near Hawaii. See below for more. UPDATE 17/02/08: Russia has now accused the USA that it is all a cover-up for an ASAT test..
UPDATE 14/02/08: News reports today suggest the US military has serious plans to shoot the satellite from orbit before the time of the expected decay, and are now confirmed by the US military. See the note at the end of this post. Latest (21/02): USA 193 destroyed with a missile! News comes in that the American Navy last night (20/21 Feb) made a successful attack on USA 193, destroying it into multiple pieces with a SM-3 missile shot at 3:26 am GMT from the USS Lake Erie. Amateur observers on the Canadian west coast report observing a spectacular shower of fragments re-entering in the atmosphere over Canada within 10 minutes after the successful attack. More fragments might come down today elsewhere along the former satellite's flight path. The weekend of 25 January, after what appeared to be an "organized leak" by a US government agency, the imminent decay of the failed reconnaisance satellite USA 193 (06-057A) gathered press attention. USA 193 was launched on 14 December 2006 as NROL-21 with a Delta II rocket from Vandenberg Air Force Base in California. It somehow failed and went "dead" shortly after launch. There is no sign that its orbit has been under control since, and amateur satellite trackers were already long aware that the satellite orbit was decaying and the satellite doomed due to this. Some sources suggest failure of an onboard computer as the problem with the satellite. Imaging by John Locker shows no sign of solar panels, which brings in the option of a power failure due to a failure to deploy the panels. 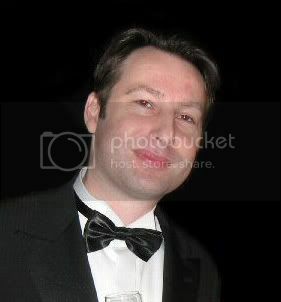 Ted Molczan has suggested that an onboard computer boot failure prevented the panels from deploying, causing a loss of power when the batteries ran down, and notes that this tallies with the fact that radio signals from the satellite were logged by amateur radio trackers for 1.5 days after launch but then died down. The orbital inclination of the satellite was 58.5 degrees meaning it roughly covered all locations between 60 degrees north and south latitude. It was probably intended as a test platform for a new generation reconnaisance sats about the purpose and construction of which little is known. Sources differ on whether it could have been an optic or radar reco platform, or maybe both. According to the usually knowledgeable globalsecurity.org, it was a radar reco sat intended to replace the Lacrosse system and probably weighing about 3300 kg (which is only 1/3rd of the 9000 kg reported in the press for the object). Imaging by John Locker from September 2007 suggests the satellite was about 4 meters large. The official NRO press release at the time of the launch only stated that "the satellite launched will provide invaluable intelligence data to support the war on terrorism". 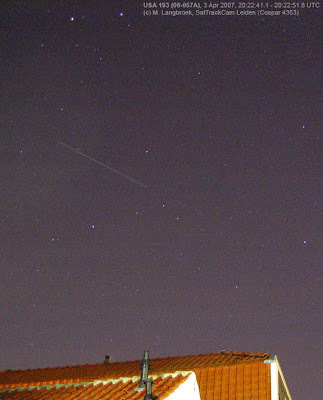 USA 193 was a satellite which was part of my regular observing program, observed and imaged by me several times. It was a bright naked eye target, reaching magnitude +1 under favourable illumination conditions, zipping across the sky at a spectacular high speed due to it's low orbital altitude. At the end of it's one year "life", it's perigeum was already below 250 km above earth surface and in its last weeks it was coming down fast (see diagram below). Below diagram shows the altitude decay of the perigee (and apogee) of the orbit over time, and how the decay rate was accelerating. The final rate of decay was over 1 km/day. The last orbit calculated by Molczan (08052.017 epoch) measured 242 x 257 km and provided a nominal value of the expected decay date of March 12th, but this value has an uncertainty of many days. On February 21st at 3:29 GMT, the satellite was destroyed by an SM-3 missile, making the subject of the expected decay date moot. The large media attention to the imminent satellite decay was somewhat surprising, and the same goes for the fact that the US government itself has brought the imminent decay to the attention. We failed to see the reason for this. Among (amateur) satellite observers it was already known for a long time that this decay was about to happen. Moreover, the question is how much of an extra risk this decay really posed compared to other decays happening several times a year. Chances that the impact of remains, if any, posed damage to property or persons are minimal. Only if someone comes into direct contact with hydrazine fuel remnants, risks are involved. With several earlier occasions of satellite or rocket fuel tanks reaching earth surface intact in the past, this so far never has happened. In fact, the chances that a random passenger aircraft with fuel tanks will drop on your head today, are considerably bigger than the chance that USA 193's fuel tank would have done. The whole situation as to the "why?" of bringing the satellite decay (and later the ASAT-attack on it) so prominently into the news definitely has open questions. Some wild speculation about the potential presence of a nuclear (Plutonium based) power system on board has been popping up here and there, e.g. in the discussion on Slashdot, in The Observer and here. There is no reason to think the latter is really likely according to several specialists. On February 14th, the US military announced that they had plans to shoot the satellite down with a missile, "to reduce the danger to human beings". This gives a new twist to the story. Official sources state that here is about 450 kg of hydrazine fuel (a very toxic substance) on board, and an expected 1100 kg (about one tonne) of debris of the satellite itself might reach earth surface intact. The plan was (and we now know they did it too) to intercept the satellite in the week following February 20, using one or more SM-3 intercept missiles fired from naval vessels in the North Pacific. The SM-3 missiles need to be modified for this task as they normally target object at lower altitude on a ballistic trajectory instead of a true orbit. The term "shooting it down" is, by the way, a bit misleading here. In reality, what happened is that the impact of the ASAT weapon broke up the satellite in many pieces, which will continue their orbit around the earth as a debris cloud. Due to their higher surface-to-mass ratio, smaller debris pieces will experience increased drag, which will make them decay earlier than the intact satellite would have. On Feb 18th Ted Molczan has drawn attention to a NOTAM, issued by the US Government, that pointed to a possible ASAT attempt on USA 193 on Feb 21, 3:30 GMT. 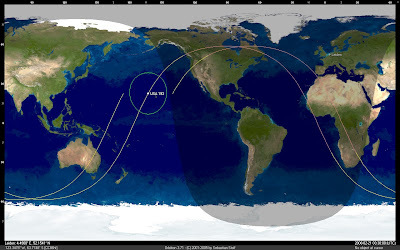 An ASAT attack at this moment in this ground track would mean that within minutes the resulting debris cloud would come into range of ground tracking stations at the US West coast, where twilight would just have ended (and with the full moon being in eclipse at that moment (!) and low in the sky anyway, it woild be no hindrance to optical tracking facilities for tracking faint fragments). Next the debris cloud would pass over the arctic region of North America, where several radar tracking facilities exist. Also, any quickly re-entering fragments would come down over the barren Canadian Arctic, rather than pass over highly populated areas. 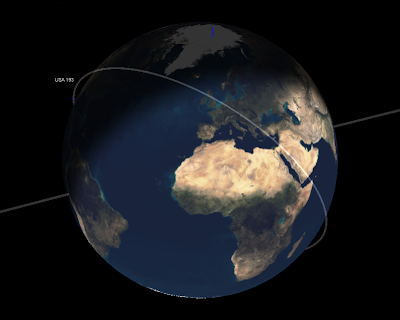 For a full orbit following an attack at this location, debris will not pass over significant inhabited land, as can be seen in the map below showing the trajectory of the satellite. Hawaii itself would provide valuable tracking facilities prior and after the intercept. On February 21st 2008 at 3:29 GMT (and quite along the anticipation described above), the satellite was indeed successfully destroyed with a SM-3 missile shot at 3:26 am GMT from the USS Lake Erie. As mentioned, there are questions as to the "why?" of the high profile media publicity of this all. Some observers have started to wonder whether it might all be a very cleverly orchestrated setup by the US Government, designed to get maximum global attention to an ASAT demonstration. Indeed, Russia has publicly accused the USA of covering-up a true ASAT-test with this. a) They send a high profile geopolitical message to China, and to the homefront, in answer to last year's Chinese ASAT test on Fengyun 1C. Basically, this message says: "you/they can shoot satellites out of the sky, okay. But remember we can too, so don't even dare to try ours or we will do the same to yours/theirs..."
b) They give some rendement to an otherwise worthless assemblage of several millions of Dollars worth of inoperative scrap metal now uselessly orbiting this planet. I can't really comment on the value of this speculation, as I am not an expert on military geopolitics. 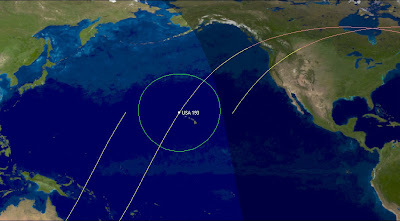 A valid argument against (a) raised by some is however, that shooting down USA 193 at 250 km altitude is not quite the typical situation for an ASAT attack as this is much lower than the normal operational altitude of satellites. It is known from the succesfull ASAT test on the Solwind satellite (which orbitted at 550 km altitude) which the USA carried out in September 1985 however, that the USA does possess the capability to reach higher altitudes. The problem with ASAT attacks is moreover not so much the altitude to reach, but rather to hit the (small, fast moving) target. As a reminder that the USA is capable of this, the demonstration would suffice, and USA 193 is the ideal target for it. Because of its low orbit, the formation of a debris cloud such as happened with the Chinese ASAT demonstration early last year isn't such a concern. Because of the low altitude, and unlike with the Chinese ASAT test, most if not all debris pieces would re-enter into the earth atmosphere within days after the ASAT attack, and therefore will not propose a real hazard to other satellites. This means the USA can use this object as a target without fear of being called hypocrits after their fierce criticism of the Chinese ASAT test last year, which created a high altitude, long lasting debris field which does provide a threath to other satellites. Hi. Good information and blog. Much appreciated. Really found the photo of US 193 most interesting. Leo Zaza. How can I track this satellite? Do u have the TLE of US 193? I just looked up that photo on the net; heard about a falling satellite. It only lasted a few years, if that. Try another website for tracking purposes, you anonymous thing you. Sources with tracking information including TLE data are linked in the right hand column of this blog. I'd like to know how much this thing cost us, for it to only last not even a year? Nice use of taxpayer money! Greetings; This entire sortie would be well worth the $ if the Chinese(& others)believe we can hit USA 193 with a missile from 1 of our ships. Hope they(them) don't believe we sent up explosives with the shuttle to make a bang @ the proper time...we'll see. "Bear"
Thanks very much for the good information and your insights. As an American, it's good to hear what others in the world have to say. >>How can I track this satellite? >>Do u have the TLE of US 193? Thanks for you well written blog on this topic. However, regarding the intended message by the U.S. to China, the message is more likely this: "We, the U.S., have now an operational capability to shoot down any ICBM that you are shooting our way". The Naval AEGIS system with the SM-3 missile is designed as a ballistic missile shield and has performed some succesful tests, but a public display of its capabilities may now be performed. the Chinese use us and would! blow our butts off the earth.Great article. Am I the only one that thinks it really weird that of all the times for this satellite to be shot down, they do it right in the middle of the only lunar eclipse in the entire time length of the satellite's decaying orbit? Note: Pentagon briefing yesterday morning... "We have a 2.5 hour window to shoot it down." Really? I think they perhaps choose this moment because it means moonlight will not interfere with optical tracking of the resulting debris from the US west coast.